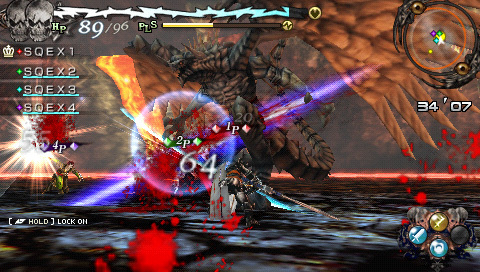 Lord of Arcana is a new action game from Square Enix. Set in a unique and beautiful fantasy world called Horodyn, so named for its first King. The game looks just like you'd expect from a modern Square Enix game. Lush environments, vast selection of weaponry; 1 handed swords, 2 handed swords, maces, spears and axes, armour and orbs (used to add extra abilities such as increased physical attack, Lock on to weak spots and Increased Dowsing rate). Gameplay is easy enough; battles are very well presented and the Coup de Grace when you defeat an enemy is brutal and bloody. 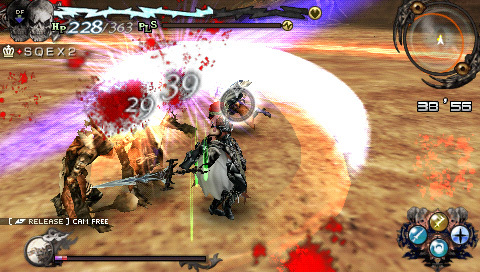 In combat you have the standard attack button (square), the defend button (cross), the magin button (circle) and the special attack button (triangle). Sprinting is limited as you have a pulse metre which fills up when you exert yourself such as rolling, sprinting and jump attacking. You will have to stroll for a little while to allow your pulse to lower, this also applies to battles. The game can be played either on your own or with up to 3 other people as a guild, the co-op is via a local connection (Ad-Hoc) and this allows you to receive help if you are finding a particular part difficult. There are currently five DLC packs available for the game (Correct at time of writing) which can be downloaded for free and they add extra quests to the ones set by your guild and the Arcana quests from the temple. The game also has a unique way of collecting items, they appear on the ground as cylinders of light, just walk up to them and press circle to pick them up, most of the time, there are multiple items in the same spot, but you have to bear in mind that you only have 16 slots to carry items with you and you may come across a monster who can be harvested for a core which in turn can be used to make stronger weapons so you have to balance what you pick up. A surprise in this game is that you have the choice of purchasing items outright, which can be expensive, or you can use some of your items and some money to make the items you need. An example is the simple potion. It costs 36 to buy outright, but only 15 if you use 1x Starch Spud and 1x Clean Water to make one. As I said before the gameplay works very well, the transition between battles and the level are quick, the levels are big but are split into smaller sections as there are sometimes locked doors to open. The amount of content makes it worth every penny as well as the extra DLC quests that are available for free!